The Aluminium Radiator is a popular choice for people looking for an inexpensive product that can help reduce Heating Bills whilst not compromising the most important thing, that being Heat Output. Very easy to fit due to the lightweight, these are a installers favourite. Our Range of Aluminium Radiators are sourced from Europe's leading Manufacturers such as Faral, Sira and Vasco. 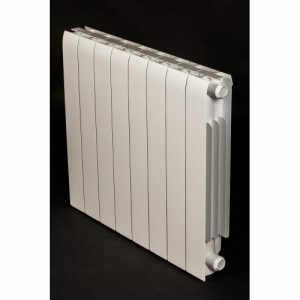 We stock the original Flat Fronted Die Cast Radiator such as the Ali-Royal in a range of Popular Sizes along with the popular Rubino, this versatile Radiator is a very good choice if you require a number of products in a range of sizes from the very low 242mm high right through to the Rubino Maxi that extends to a 2042mm height. 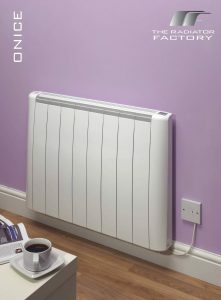 If you require a more contemporary look or fancy a coloured radiator then our Vasco Aluminium are the "tour de force" with there unrivalled quality & very low water content. 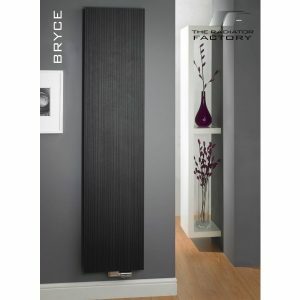 The Bryce Plus in particular doesn't even look like a Radiator & really is a piece of Art. See below our stocked range of sizes & colours. The Onice Electron is made in Italy with an exclusive technology, patented throughoutthe world. The technical principal consists of the insertion of a special electrical resistance in armoured steel, one for each radiator element, directly in the mould. High pressure aluminium die casting shapes the radiator arount the electrical resistance,thus becoming the nucleus and an itegral part of the radiator itself. As a consequence, Onice is different from all other electric radiators, functioning without internal oile or fluids. This makes it ideal for use with systems that use photovoltaic panels due to this revolutionary technology. 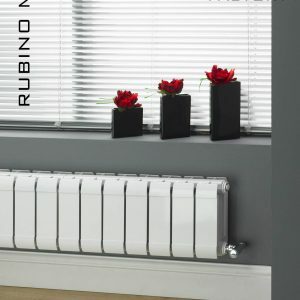 With their head turning fluted fin design, the high output Rubino Midi & Maxi radiate individually as well as warmth. Seen face on, the dynamic, streamlined fins rise dramatically, like long wide freeways. At the sides, slim parallels literally add edge to this design. 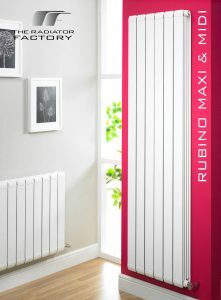 In a choice of lengths and widths, the aluminium Rubino Midi & Maxi help enhance your home and workplace. Both models are guaranteed for 15 years and finished in white. The Rubino Mini takes style to the max, featuring fluted fins reminiscent of aeronautic or automotive design. From the front, the fins are broad, flat panes gently curving top and bottom. Each end, the narrow fluting is visible, like a stylish air intake. Available in a versatile size range, finished in white and guaranteed for 15 years, the Rubino Mini is ideal anywhere in house or office, but particularly in conservatories and summer rooms.